Stories of the heart! Stories of passion! Stories of the triumph of the human spirit! That's Romance, one of radio's forgotten classics. 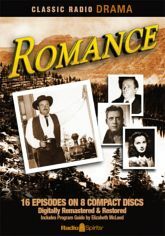 Written, produced and performed in the great dramatic fashion of Suspense, Escape, and Gunsmoke, Romance offers an intriguing, adventuresome take on the inner force that drives us all. Here are 16 digitally remastered episodes about "the courage, the devotion, the adventure of love�all strung on the bright thread of�Romance!" These original broadcasts -- produced and directed by radio legends Norman MacDonnell, Antony Ellis, and William N. Robson -- feature memorable performances by such favorites as William Conrad, Georgia Ellis, Howard MacNear, Peggy Webber, and John Dehner. Romance is a delight for any fan of quality radio drama!